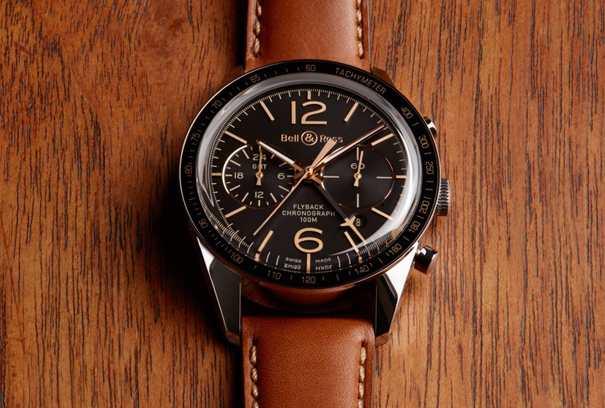 BR 126 Sport Heritage GMT & Flyback from Bell & Ross.126 Chronograph Sport Heritage GMT & Flyback functions and display a second time zone. 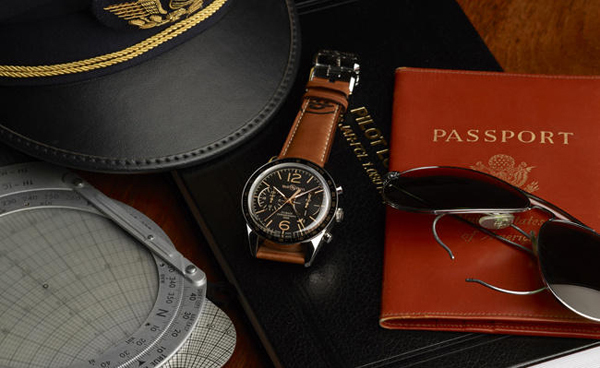 Manufacturer Bell & Ross presents its new creation – Aviation BR 126 Chronograph Sport Heritage GMT & Flyback functions and display a second time zone. 43 mm round case height of 15 mm is made of stainless steel. Water Resistant – 100 meters. Complements the housing bezel with black coating and tachymeter scale. Black dial, sapphire glass enclosed, equipped with Arabic numerals 12 and 6, overlaid gilded marks, chronograph counters at 3 and 9 markers, date aperture between markers 4 and 5 hour and minute hands are coated with white luminous material. Novelty BR 126 Sport Heritage GMT & Flyback caliber is equipped with a self-winding. Watch is delivered with a leather strap brown with butterfly clasp made of stainless steel. Limited production model – 500 copies.